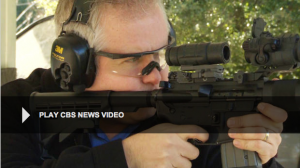 Gene Hoffman, Co-Founder and Chairman of the Calguns Foundation, took to the air with CBS News yesterday to explain why semi-auto firearms are so popular amongst gun owners. Speaking in particular about the AR-15, CBS noted that more than 3 million Americans now own one. Gene added that it “is the most popular selling firearm [in America].” That is actually very important from a legal perspective since Heller tells us that the Second Amendment protects those firearms in “common use at the time” and the most popular firearm in America certainly meets that description. This entry was posted in AR-15, California, Semi-Auto Firearms. Bookmark the permalink.